7.06 points at 16 votes (rank 333). Little Henry is the king in his house. He is bored and therefore he scrambles about in the house. Suddenly he decides to tidy up. Which is badly needed, as there are the most absurd items lying around. In this house there are altogether eight rooms of which each represents a level. To get from one room to the next, he has to collect all the items on his way and then get to the exit. Henry is not stressed during tidying up, as there is no time limit. There is a closet, a bath, a kitchen, a living room, playroom, bedroom and a dining room, as well as a cellar. Each of these rooms has the size of one screen (no scrolling). The graphics are pleasing and coloured. Some rooms also offer surprises, e.g. if you collect the peg in the bath, the water is drained from the tub and sets free further items there. In each room there are different items that you need to collect or must not collect. Henry is especially not allowed to touch walls, this will cost a life. Usually, bigger items as crown or coffin or moving parts as shoes or spiders must not be touched. Also you should avoid to crash, i.e. at best only make small jumps from platform to platform. Be aware that there is no time limit, so you can look calmly at the build-up of the level. If you want to restart at the previously played level after a Game Over, press the fire button instead of the key "F7". The version by "Remember" offers next to some trainers (unlimited lives, invulnerability, choose starting room, jump level) also the manual. 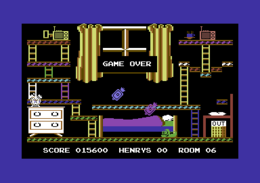 Jodigi: "A rather nice arcade game, partially rather tricky, whereby I had to try out what Henry is allowed to do and what not at the beginning (in 1986)." Guybrush: "But it was made very neatly for 1986. The difficulty grade is steep, but I liked to fiddle with it anyway. 8 points from me." Robotron2084: "Designed lovingly with many small details and cuddly brightly coloured graphics but at the same time also rather difficult. A model example for the platform genre! 7 of 10 points." 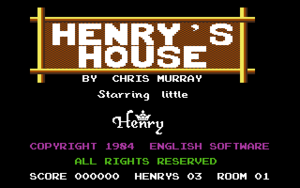 The programmer Chris Murray was only 16 years old when he wrote the game. 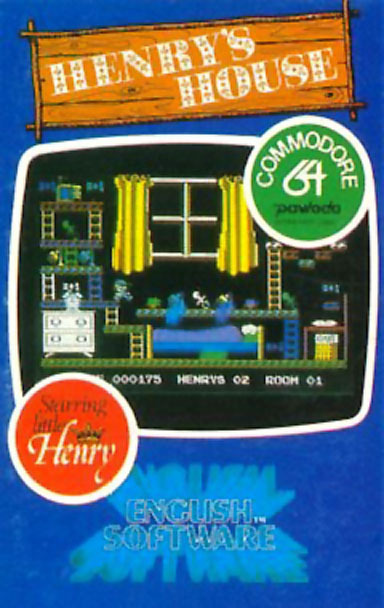 The title of the game should originally be "Home Sweet Home". But it was renamed „Henry’s House“ by English Software, to profit from the then popularity of the newly born Prince Henry. Programmer’s quote from the Lemon64 Board. 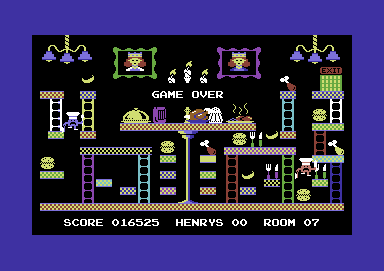 "The game was originally going to be called Home Sweet Home (hence the graphic) but the publisher was trying to cash in on Prince Harry who was recently born." This page was last modified on 24 November 2014, at 23:27. This page has been accessed 6,158 times.